Since 1996, the number of 20-34 year olds living at home has increased by 669,000 (25%), showing a strong decrease in the average number of people flying the nest. The idea of a full family home is now a much more common route in modern living. There are growing numbers of students moving back home, as well as the increase and popularity of “granny annexes” over nursing homes. According to The Telegraph, England’s average nursing home cost per year has risen to £27,404, up from £25,953 in 2011, with the average pensioner income now just £13,208, and that’s not even for the top homes! As well as this, 237,000 university students in the UK are still living at home with parents, up 50% in 10 years. So where is all this needed space going to come from? What is the perfect solution to not only keep you as a couple happy with your current living arrangement, but also keep your family happy, save money and increase the profitability of your home? Turning your garage into a lavish living area! Well-designed and well-structured garage conversions not only save on costs of upscaling, but in the long run increase your profit when it comes to selling, by having an additional living space. The best thing with garage conversions, is due to the nature of their design, the vast majority of garages will not need any alteration within the structure, and if you are lucky enough to have a double garage, this can be easily converted into a 2 level complex living area. The design of garages is generally longer and thinner, rather than the usually preferred square rooms. A great way to even out the floor space, as well as splitting the living space is to consider using a studwork wall partition. Make sure you plan out your space first, then incorporate these easy to build walls within your home. A step by step guide on how to build these walls is available here. Damp proofing and insulation will be a necessity within your garage conversion to ensure the living space is safe and secure. Due to the importance of this phase, if you do not have a sufficient amount of knowledge on damp proofing and insulation, I would recommend going to your nearest home depot and making the enquiry just to be on the safe side. Just as essential as the previous phase, the plumbing and wiring of your garage conversion must be up to scratch. Especially if you are thinking of creating a self-contained living space, including a bathroom and a kitchen. If you are planning on re-wiring the conversion independently, check out this guide to rewiring. In terms of the plumbing and heating, this is generally seen as a more complex job, and again if you are not in the trade yourself or know anyone that is, I would recommend searching for industry specialists and getting a quote. Flooring is generally an easier process and most likely will not require vast amounts of expenditure. The original garage floor will be sufficiently strong, and only require additional damp proofing and insulation. The easiest route to go down would be to incorporate a timber floor built over the existing concrete. A gap of around 150mm between the joints and floor will be required, as well as damp proofing underneath the timber and between the joints. A step by step guide to installing a wooden floor within your garage can be found here. The garage conversion will require ample ventilation via windows and doors. In order to meet building regulations, a window must be 1/20 of the floor space and have trickle vents. The door must also provide a valid escape route in terms of fire regulation, so take this into account when designing your new living area. 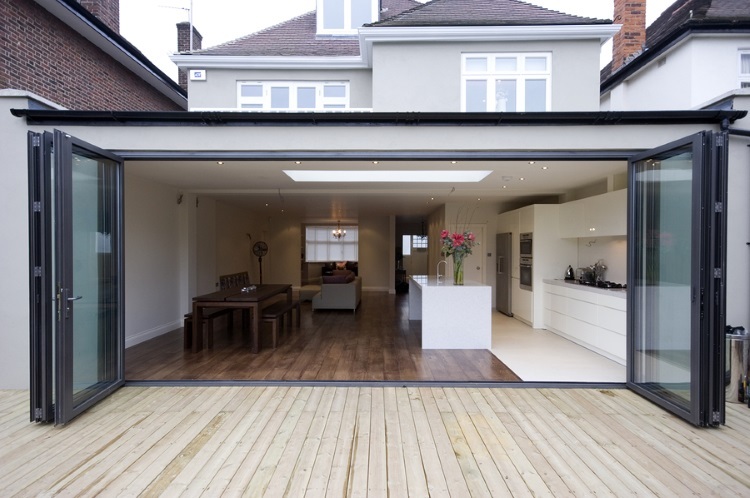 When building a garage conversion, there are usually no permission requirements if you are not altering the base structure of the internal house. However, it is always worth reading into what permissions you may need just to be on the safe side. A minor downside to creating a self-contained living space is that your new guest may be classed as a separate dwelling, meaning a separate council tax payment is required. However, if this is the case, contact your local council tax office and explain the situation, they may be more lenient given the circumstances. Now for the fun part. Decorating your new garage will be the main aesthetic process. Make sure you know what your loved one likes, as well as the necessities they require. Check out blogs and sites such as Pinterest for inspiration on designing the perfect décor for your nearest and dearest.